From sauces, marinades, or cooked products, the Poly-ware food pan cover is ready to hold any and all of them! 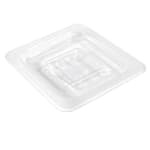 Manufactured by Winco, these solid polycarbonate pan covers are built to hold about any item you can imagine and also are made to resist breaking or cracking. These particular food pan covers feature 1/6 size dimensions.